Did you know the original ice cream sandwich was made with two very thin graham crackers? A pushcart peddler in New York City brought this dessert sandwich to life in 1899. Today, traditional ice cream sandwiches are made with vanilla ice cream layered between two chocolate cookies. We put together five unique ice cream sandwich recipes that are a cool twist on the normal chocolate cookie and vanilla ice cream combo. 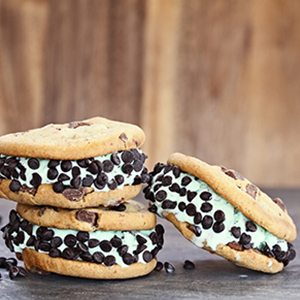 Ice cream and cookies are definitely mint for one another! This recipe combines our cool and refreshing Mint Chocolate Chip Ice Cream with our Bakery Chocolate Chip Cookies. 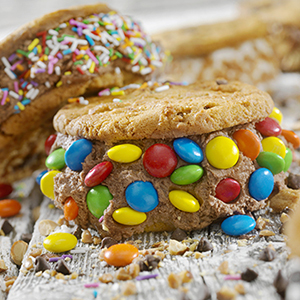 Grab two cookies from your pack and place a scoop of ice cream in the center, then enjoy your masterpiece! Want even more chocolate goodness? Cover the sides of the sandwich in our milk chocolate morsels! This peanut butter and chocolate ice cream sandwich can win over even the toughest crowd! Whip up some Simple Peanut Butter Cookies, allow them to cool, then sandwich our creamy Publix Chocolate Ice Cream in the middle of two cookies. To complete your treat, dip your sandwich in chocolate candy or sprinkles. If you love classic strawberry shortcake, this is treat for you! 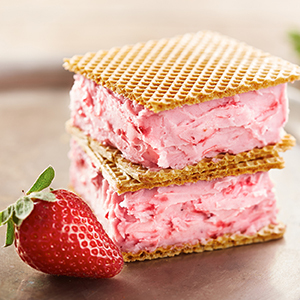 This winning combo is made with our sweet Publix Strawberry Ice Cream which is filled with ripe, red strawberries and waffle cookies. For a true shortcake, use our Pound Cake instead of cookies. After your cake has cooled, grab two slices and add a scoop of ice cream with a spoon. Smooth the ice cream out to reach the edge of the cake and top it off with a fresh strawberry. Stick everything in the freezer for 10 minutes to solidify before serving. 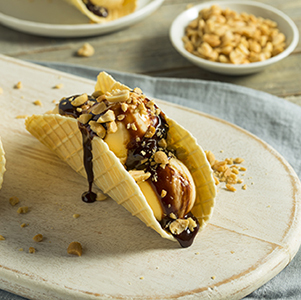 Let’s taco-bout how amazing ice cream tacos are! These are made with our Publix Homemade Style Vanilla ice cream and waffle mix. To make your own ice cream tacos, place a thin layer of waffle mix on your waffle iron and let it cook. After they’re finished, fold your waffles to create a taco shape and let them cool. When completely cooled, add your scoops of ice cream and drizzle with your favorite toppings like chocolate sauce and peanuts! Which ice cream sandwich do you want to try first? Let us know on Facebook, Twitter and Instagram!